Each month, we feature one exceptional chocolatier or boutique chocolate shop then assemble a variety of their signature creation along with our monthly newsletter, In Pursuit of Chocolate, offering origins and histories of each featured chocolate, what creative ingredients were used to make them, and most importantly, what to look for when tasting them. The best way to see exactly what you get each month is to review our current annual chocolate calendar. Can I combine a chocolate club membership with a flower club membership? The International Wine of the Month Club – receive two bottles of red wine, white wine, or one of each through four monthly wine club options. The Microbrewed Beer of the Month Club™ – choose between five craft beer clubs offering US craft beer, international beer, hop-forward beer, and hard-to-find rare beers. The Gourmet Cheese of the Month Club – each month, you'll receive three ½-pound selections of artisanal cheese from the world's top cheesemakers featured in our two cheese clubs including our new Rare Cheese Club. Our 100% Satisfaction Guarantee ensures that every chocolate you purchase from The Gourmet Chocolate of the Month Club meets your high standards or we will replace it or refund your purchase. Simple as that. Why should I choose The Gourmet Chocolate of the Month Club? 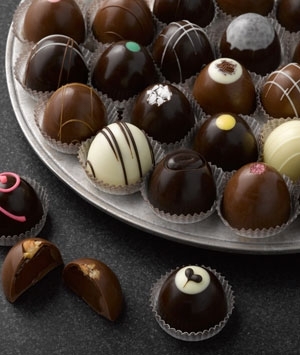 To select our featured chocolatiers, we work closely with Zingerman's®, named by Food and Wine Magazine as 1 of 25 of the World's Best Food Markets. They help us source true artisanal chocolates, hand-made from fresh, wholesome ingredients and crafted in small batches with dedication to innovation and artistry. Many of our chocolatiers have been repeatedly acknowledged in their industry, but often their products have very limited distribution due to their limited production capabilities. All of our chocolates are made to order from secret blends of the highest quality cocoa beans, ripened, fermented, and roasted to perfection. You will taste the difference. We stand by every chocolate we send you and back it up with our 100% Satisfaction Guarantee and a dedication to responsive, friendly and knowledgeable customer service that's earned us an A+ rating with the Better Business Bureau. Learn more about our chocolate selection process. Your card will be charged on the 7th of the month that your membership commences. If you chose to have your membership commence this month, but your order was placed after the 7th, your card will be charged within 2 business days. Charges for memberships commencing in a future month will take place on the 7th of the first month shipped. Where can you ship a chocolate club membership? We ship within the continental 48 United States. We cannot ship to Hawaii or Alaska. Initial shipments: are sent on either the 3rd or 4th Tuesday or Wednesday of the month, depending on when your order was placed. Subsequent shipments: are sent on the 3rd Tuesday or Wednesday of the month. NOTE: November & December ship dates are moved up one week to avoid conflicting with Thanksgiving and Christmas. Shipments are sent via Next Day Air Service from May–September and 2-Day Service from October–April. All shipments are sent via Federal Express. Due to the perishable nature of the product, shipments are sent without a signature required to avoid excessive time in the carrier's possession. It is therefore very important that you ship to a location where someone will be there to receive it. Many of our members ship to work locations or to a neighbor who is often home.